Many organizations already own Microsoft Project and SharePoint – but few take advantage of the synergy these two products create when used together. 1. The most important factor to drive project management maturity. 2. 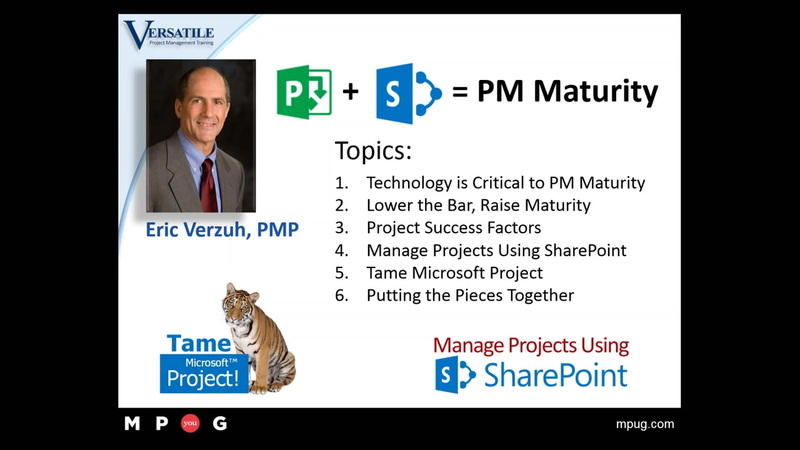 Five critical project management functions you can perform with SharePoint. 3. How SharePoint extends the impact of Project to create compelling schedule visibility. 4. Why SharePoint is easier to use than Excel for managing tasks. 5. How to reduce the time spent preparing status reports while you increase engagement with your Sponsor. The Versatile Company wrote the book on practical project management. The Fast Forward MBA in Project Management has been the most popular handbook for project leaders and teams since it was released in 1999. Now Versatile has merged the practical lessons in this book into SharePoint to make a powerful, practical way to manage projects. Eric Verzuh is the bestselling author of The Fast Forward MBA in Project Management. He is the President and Founder of The Versatile Company, a firm that delivers training on project management topics to thousands of professionals every year. Excellent information presented in a short time. This helps to get everyone up to date on the issues and helps their use of the technologies in the right way for the organization they are working. thank you for the Session and the good Information. is there a Chance to get the PPTx?